What is Your Social Media Voice? Echo chamber. Vacuum. These are just some of the terms used to describe the social media environment within which we communicate — ubiquitously — through posts and comments. The desire to communicate has become insatiable — the need to post, comment and, for some of us, chase the viral unicorn. Some statistical context around engagement. My thanks to Jimit Bagadiya of SocialPilot.co who tread the statistical waters to provide some of these compelling numbers. There are 3.5 billion users on the internet. 100 million hours of video content are viewed on Facebook daily. 35 million Facebook users update their status daily. 500 million Tweets are generated per day, an average of 5,787 per second. 40% of LinkedIn’s 500 million members use the channel daily. 95 million photos are uploaded every day to Instagram. 400 hours of video are uploaded to Youtube daily and 80% of them are viewed outside the US (that prompted a second take from this writer). According to Scrunch.com, the average engagement rate on Instagram runs between 1% and 3% (considered acceptable). Meetedgar.com reports that 46% of Twitter users log on once a day; 34% check it more than once and spend only 60 seconds on the platform. (Talk about a moving target; meaning frequency of posting is everything). It’s a jungle. (Factoid: one acre of Amazon rainforest is home to 70,000 species of insects.) Kinda’ puts things in perspective. So, we put up our insect-attracting lights and think, “They will come!”, and it will be meaningful, except, they disappear in a flash of terminal heat, much like our posts on social media. About your voice. Why should it matter that you know more about your voice? Social media experts and brand strategists expound much around the topic of relevance. So, the first question you might ask yourself is, “Am I relevant to my audience?” YES — you have an audience. You can call them friends, contacts, colleagues, customers — regardless of how you define them, they are an audience, in some cases a target market. Ultimately, they are readers and viewers. Second question: “Who are you communicating to?” Are they simply your friends — or just contacts? Is it your expectation or selfish hope that they hang on every word you say? Nothing wrong with that. It does say that you expect unconditional acceptance; a lofty notion in some respects. Certainly, your fans respond predictably; however, the perspectives of many others in your community might shock you. Granted, this may not be an issue for you depending on what your voice is. What do I really know about my audience; my readers? From this perspective, one investigates the shadows (negative space, if you will) as well the light to understand and respond to life’s events both from a personal perspective as well as a more objective global view, which is generally subjective anyway. The hope is that the content motivates thinking and considerations of new perspectives — perhaps even enlightenment, leading to an improvement in the human condition. In simpler terms, this aforementioned voice is always examining the underbelly of thinking and perhaps offers perspectives not previously considered. Why does this writer use this voice? Because it informs and contributes to knowledge, understanding and wisdom — which affects everything in the personal and professional experience. For most us — the billions using social media — it is an exercise in futility to consider these questions because the experience is generally organic. Posting, commenting, liking — they are responses on the fly at the best of times; however, if you are posting your thoughts with a desire to offer something tangible to others, it implies that you want to make a difference or maybe just to be noticed and accepted. Knowing your voice is an important component to the impact your posts will have. Otherwise, the communication experience is exclusive to you: absolute self-expression serving only you, which, to repeat, is certainly valid. Being gregarious is a choice, not an obligation. So, here are questions to answer (including the aforementioned), which, if you’re inclined, can direct you to a meaningful understanding of who you are within the posts you generate. Describe the themes your posts tend to reflect: spontaneous, humorous, ironic, informative, enlightening, educational, color commentary of life … etc. Describe yourself as a communicator in social media. Are you a philosopher, critic, counsellor, advisor, specialist, pundit, dilettante, comedian, humorist, teacher, parent, agitator, self-absorbed, bleeding heart, chasing acceptance, spiritual, tree hugger, cause cheerleader, innovator, dreamer …? What kind of posts get your attention and compel a response from you? Who is your audience? Family? Friends? Colleagues? Adversaries? Passers-by? What is your concept or sense of the people who you know read your posts? What posts do they like consistently? What kind of comments do they respond with? Do they debate, agree, or offer a third, unexpected perspective? Are they agreeable, adversarial or philosophical? Are ‘likes’ or ‘comments’ important to you? Do you care? If NOT, then why do you post? Caveat: posting for no reason is not without reason. Even if you do not take an audience into account, writing or posting as self-expression does not happen in a vacuum. It may be that personal expression is the driving motivator — and there is nothing wrong with that; however, this writer believes most social media users (who are sane) post or publish with some context of readership or viewer. Are ‘likes’ or ‘comments’ important to you? Do you care or not? If NOT, then why do you post? UCP – Unique Content Proposition — is a spin off from USP (Unique Selling Proposition). Marketers rely on unique positioning strategies to drive their brand. Social media gives their brand a definitive voice in the market place. As more and more individuals begin to establish their own small businesses, especially within the online domain, the need to create unique content becomes an increasing imperative. The truth can be said for individuals actively communicating online for personal reasons. Albeit that most of the personal content is ad hoc, it would be ignorant to assume that there is no purpose associated with personal communications through written and visual postings. To some degree, it might be suggested that many individuals are seeking to define their own unique identity through their communications online. On one hand, we want to be unique; on the other hand, we need to belong to something; to be accepted. 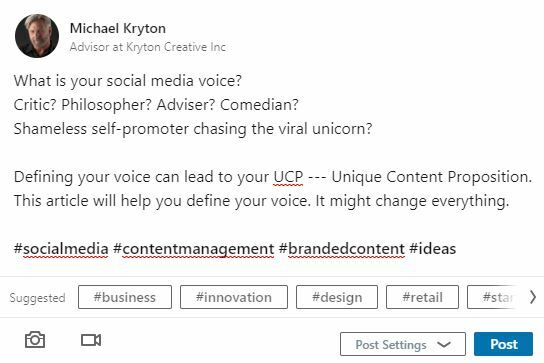 Your UCP – Unique Content Proposition — is driven by your voice.